"Tilapia Pita - say it ten times real fast. A delightful light meal. Excellent for weekend afternoon gatherings, and aesthetically pleasing, too! Feel free to experiment with the seasonings and sauce ingredients to match your personal tastes." Heat oil in a large skillet over medium-high heat. Place the tilapia fillets in the skillet, and season with lemon pepper, salt and cayenne. Fry until browned on each side, and fish flakes easily with a fork, 5 to 7 minutes. Warm pita breads in the toaster or in the microwave to soften. Open from the cut side to make pockets. 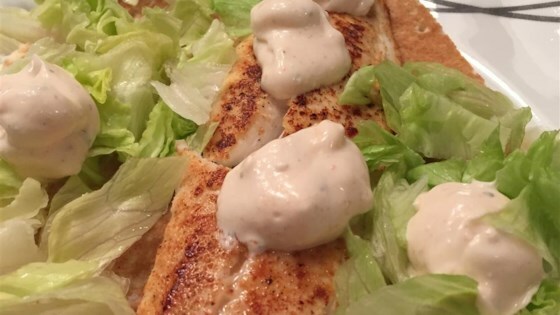 Fill pita bread halves with lettuce, onion, and tilapia fillets, then spoon in some of the feta cheese sauce. Serve and enjoy! My family loved this recipe. We made one change by adding chopped red bell pepper.